The launch of the Paediatric CPAP Mask is a further development of these revolutionary CPAP mask interfaces. 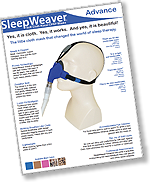 This soft cloth mask extends the SleepWeaver range to accommodate children from 2 to 7 years of age. Larger children would likely fit the Sleep Weaver Advanced Small Mask. Cloth CPAP masks are beneficial in that they put minimum pressure on the growing face. The all new, five point adjustable headgear has a wide range of adjustability to fit different head sizes. 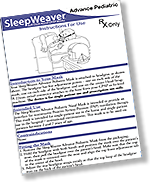 Please refer to the fitting guide to work out which SleepWeaver mask is right for you.